This page is meant to guide you through the process of backing up saves for Whipped and Steamy • Cosplay Café. This features exists namely for keeping web data safe as it might be lost during web updates and patches. However, it can also be used for backing up desktop saves easily, and even for exporting your web progress and bringing it over to the desktop version. This guide also includes an explanation on how to manually convert your old save files from Cosplay Café into new Whipped and Steamy • Cosplay Café saves. Backing up saves in Whipped and Steamy • Cosplay Café couldn’t be easier. At any moment in the game, regardless of the version, you can open the Journal menu. Scrolling down to the bottom of the Settings reveals both Export Game Data and Import Game Data options. We recommend you back-up your Web saves frequently, as updates to the game are known to wipe away existing data. Exporting your web data frequently assures that you always have the option to bring it back, even if the one in the web version ends up disappearing with a patch! Pressing the Export Game Data option will prompt-up a file explorer window where you can save a .wag file. You can save this with any name and in any location you want (just don’t forget where you put it!). (For Mac, this directory is ~/Library/Application Support/Whales And Games/Whipped And Steamy Cosplay Cafe , and for Linux ~/.config/unity3d/Whales And Games/Whipped And Steamy Cosplay Cafe). After you import your saves, the game will reboot and your freshly imported saves should be ready to go! 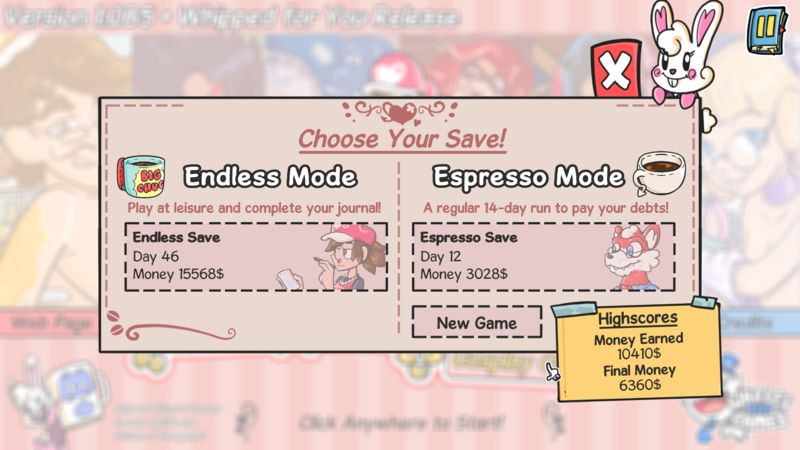 Take in note that, for future updates, saves from outdated versions or saves that were imported into the game will not count towards the Espresso Leaderboards. As of March 28th, with the release of 1.0B5 for Whipped and Steamy • Cosplay Café, the game’s name was completely renamed from the old name of Cosplay Café to its new name. Together with it, come internal project changes that affect the location of where the saves are stored, as well as how the file format is kept. Old Cosplay Café saves are still fully compatible with the new version and should automatically be transferred over when opening the new version of the game. However, some cases of errors may cause them to have to be manually moved from the old directory to their new location. This guide has screenshots and primarily explains how to move saves for the Windows version of the game, although the directories for both Mac and Linux are also included. First, start by opening the new version of the game. Just opening should be enough, and there’s no need to go further than the Title Screen. Navigate towards %UserProfile%\AppData\LocalLow\Whales And Games\Cosplay Cafe. You can type this in the address bar of your explorer and it will take you directly to this folder. Once there, you can copy or move your existing save files, which should be named CaffiesJournal.dat, HotCoffee.dat, BigChug.dat. Note that you might not have all three files if you don’t have, for example, an endless save. This is fine, and you should copy the save files that you currently have. We recommend keeping a backup of these files around for any case though! The output_log.txt and the Unity folder are not relevant to the save files. Navigate to the new directory that should have been created when you opened the new version for the first time. This directory should be %UserProfile%\AppData\LocalLow\Whales And Games\Whipped And Steamy Cosplay Cafe. Likewise to the previous example, you can copy this directory directly into your file browser address bar to move directly there. Paste or place the save files in this new folder, and you’re done! If you open the game, your files should automatically convert over to the new file format, and you’re ready to continue where you left off!